Today, I enjoyed a delicious and very affordable meal prepared by the students in the culinary program at Suncoast Technical College. Bistro 502 is a restaurant that is open to the public on the campus of Suncoast Technical College on the corner of Proctor and Beneva in Sarasota. The restaurant not only affords the public an opportunity to enjoy food prepared by up and coming culinarians but also gives the students the chance to put their training to test in a practical setting. While I dined, I had the chance to chat with Chef Brian Knecht, who has been in charge of the program at the school for the past 16 years. He explained that 4 years ago, the old school was demolished, and a brand new multi-million dollar, state of the art facility was built in its place. 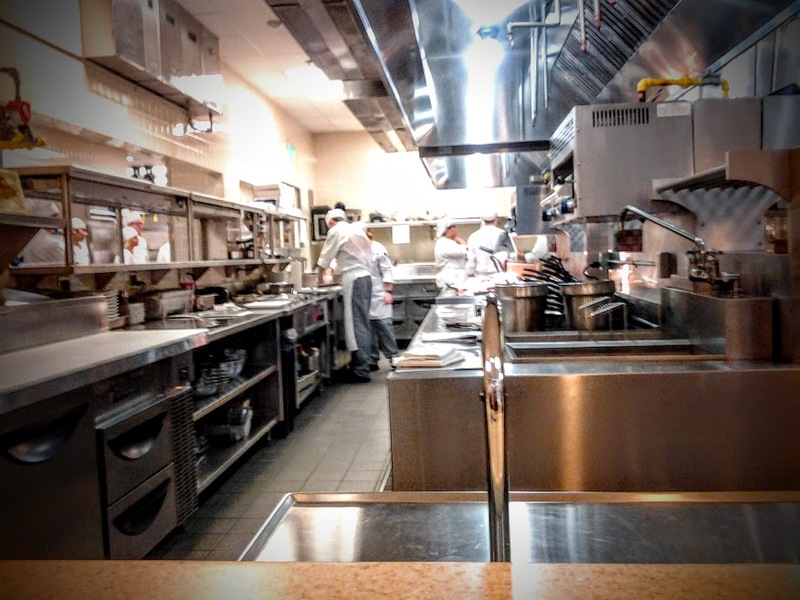 I can attest to the fact that any chef working on the Suncoast would be envious of the beautiful, sparkling clean kitchen. Currently, the school has between 40-50 students in the culinary program, comprised mainly of high school students, rounded out with about a dozen adults. Brian is proud of the fact that many of the school’s students have competed in culinary competitions on a national level, and have placed quite impressively. Both the high school students and the adults must complete 1200 hours of schooling, plus 1 year of practical experience working in the field. Typically adults can make it through the program in about a year, while it takes 2 years for high school students. All students finish the program with accredidation from The American Culinary Federation as certified culinarnians (cc). Some graduates, particularly those in high school go on to other cooking schools when they graduate or fill the much-needed employee pool for local restaurants and resorts. Ask any chef on the Suncoast what keeps them awake at night, and 9 times out of ten, the first response will be lack of trained staff. I applaud Chef Knecht, and Suncoast Technical College for offering a well-designed, comprehensive course that gives students going into the industry a sound foundation as well as practical experience. The students that graduate aren’t chefs, but rather professionals that have basic fundamental skills and are ready to be groomed. Today happened to be the first day that Bistro 502 was open for the season. They are open Tuesday – Thursday for lunch. While I was eating, Chef Knecht showed me the detailed corriculum that he has written for the program. Students not only learn to cook and serve, but also about professionalism, sanitation, nutrition, math as well as a myriad of other skills. 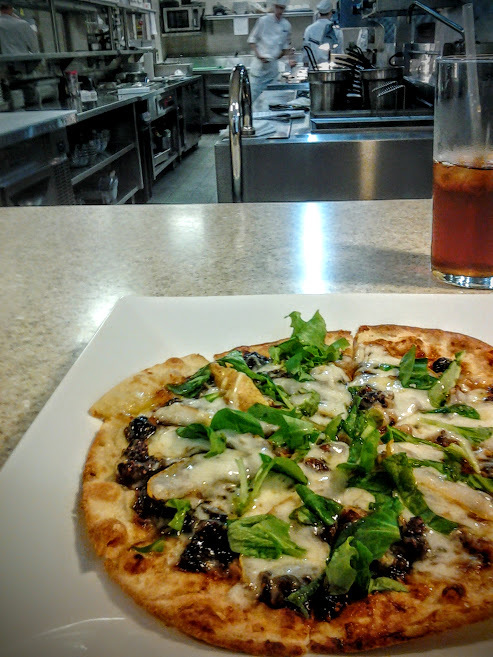 My first course today was a flatbread comprised of fig jam, pears, pecans and fontina cheese. Not only did it look delicious on the menu, but the execution was spot-on too. 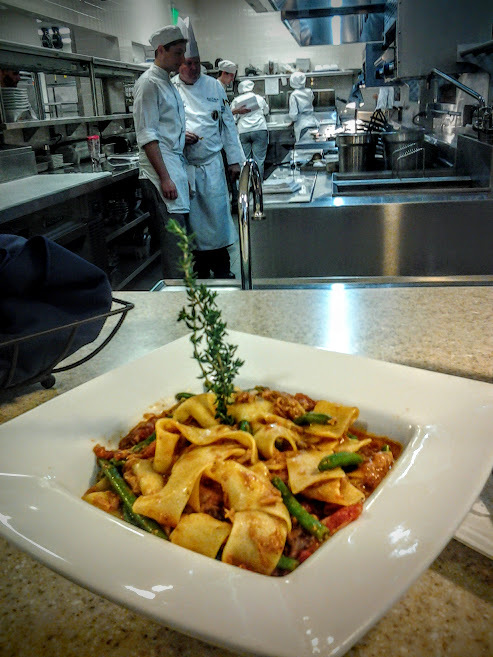 My entree was a pork ragu papardelle with haricots verts. This was comfort food at its finest. The pasta was perfectly cooked, and the ragu was rich and flavorful. There is truly something for everyone on this menu. Salads, paninis, soups rounded out with decadent desserts. The menu is quite varied, and the prices are incredibly reasonable. I suggest sitting at the bar, so that you can observe the students preparing your meal. Although this is a learning environment for the students, service is prompt, particularly if you are worried about dining during a lunch break. The menu changes seasonally, around 4 times per year. Click here for the current menu as of this writing.